Australian infantry disembarking in Crete. 2016 sees a substantial number of commemorations of famous military engagements. The most high profile has been, to date, ‘Anzac One Hundred’ in 2015 and that certainly resonated strongly with the Australian public. In August 2016, the fiftieth anniversary of the Battle of Long Tan, a pivotal Australian engagement in the Vietnam War which, to the memory of many veterans, will not seem almost half a century old. One anniversary that might slip through the net is the Battle of Crete, in May 1941. Crete was a watershed in the development of military doctrine and capability, being the first time that an exclusively airborne force had decided an operation although it was, it should be said, a near-run thing and the Germans were, almost literally, only hours from defeat before they rescued the situation. In a strategic sense the Greek campaign in 1941, culminating in the Crete operation, was forced on Hitler to secure his southern flank before turning his attention to his obsession with the destruction of the Soviet Union. The Allies, close to a decisive victory in the Western Desert, controversially removed some of their better combat formations from there and sent them to Greece. While the campaign was against Italian forces the situation on the Greek peninsula was manageable, once German forces moved into the area, backed by overwhelming air support, the campaign was unsustainable and ended in an evacuation not dissimilar, in some ways, to Dunkirk. Crete was a stepping stone backwards into the Mediterranean and worthy of defence according to Churchill who was by now frustrated by constant evacuations and seeking to ‘make a stand’, but who also saw Crete as a useful forward base: an unsinkable aircraft carrier, rather like Britain itself was in relation to continental Europe. The danger of Allied airpower, from Crete, reaching his vital Rumanian oilfields was not lost on Hitler and eventually Kurt Student, the pioneering leader of German airborne forces, persuaded Hitler that his Fallschirmjager could take Crete, with the assistance of air landed (as opposed to air dropped) forces. There had been minor German airborne operations in Norway, Belgium and Greece in the previous year or so, but sending what was a reinforced division with all supporting arms into battle on an island, while the Royal Navy retained control of the surrounding seas was, at best, a calculated risk. Among the more than 40,000 Commonwealth defenders on the island were Brigadier George Vasey’s 19th Australian Brigade, comprising the 2/1st, 2/4th and 2/11th battalions charged with the defence of the roughly central region around Retimo, or Rethymno as it is sometimes known. There followed, for several days after German airborne landings in the afternoon of 20th May 1941, fierce fighting in the area but a textbook defensive appreciation by Lieutenant Colonel Ian Campbell, commanding in the Retimo area in the absence of the brigade commander who was elsewhere on the island, enabled the Australians to emerge victorious, at least in the short term. Crete was, mostly, a battle for company and platoon commanders and the individual soldiers that they led, on both sides. These sub-units exist, of course, in a far greater context in all wars but on Crete, a battle within a battle, penned in on an island and with neither side knowing when or if they would be reinforced or supported, a successful company attack, or a stoic platoon defence, could be decisive. 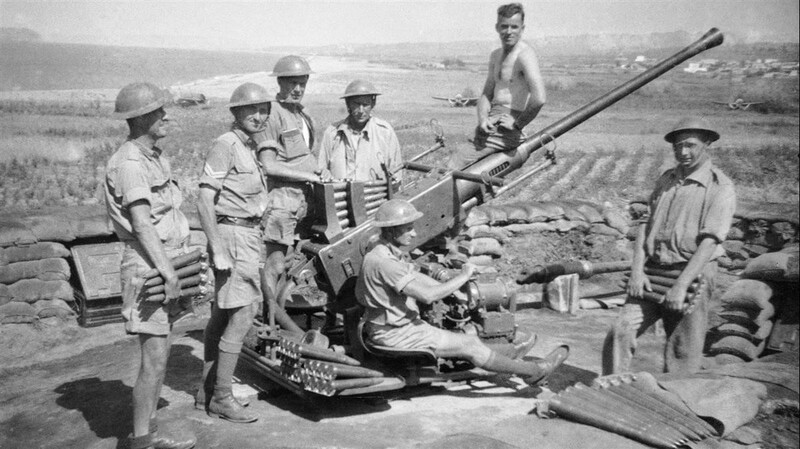 Australian light anti-aircraft weapon, with crew, in Crete. 19th Australian Brigade lost its 2/4th Battalion detached to the British led 14th Brigade down the road at Heraklion where they performed well in what was, as it turned out, another successful and energetic local defence. With, thus, only two Australian battalions, and some Greek gendarmes and infantry who were short of equipment and organisation, although not spirit, Campbell laid out his two remaining battalions to defend the airfield. Weapon ranges were maximised and precious automatic weapons, along with a smattering of captured artillery, employed to fullest extent from elevated positions around the airfield. The German assault, when it came, and where Campbell expected it to, was repelled after fierce combat. The Australians were driven off one of their key features, later recapturing it. Through the olive groves men stalked each other in a lethal game of cat and mouse while, in warm weather, agonies of thirst frustrated the infantry. This was no war of hands on large scale maps, moving corps and army sized formations across nations but a race for a weapons container, or to keep a Bren gun trained on a key objective. While the Australians held their ground the campaign was lost, effectively, at Maleme – to the west - once the Germans took that airfield and (air) landed overwhelming forces. From there the Crete campaign was a gradual withdrawal to yet another evacuation, and more suffering for the Royal Navy, but for the German airborne forces it was a pyrrhic success; so disturbed by the losses, among elite troops, was Hitler that he banned further large scale airborne operations, depriving him of his best chance to assault Malta, or even Cyprus, operations that might have been decisive in the Mediterranean theatre. Crete was a backwater for the rest of the war, but it should be remembered for a fine Australian performance under immense duress. The capacity of Campbell to make the best use of his intelligence (available to the New Zealanders further west, but subordinated to the much less likely, and less threatening, prospect of a sea assault) enabled him to identify the key objectives in his area and align to defend them. Without resupply, which needed a secure airfield in order to be delivered, the lightly equipped airborne forces were vulnerable to counterattack as the Australian battalions showed. When I think back to my own TEWTs (Tactical Exercise Without Troops) it was often a question of finding what looked to be the right piece of ground and, then, positioning sub-units, and key weapons systems, to protect, or attack them. If one assumes, probably more or less rightly, that Australian officers and soldiers, in May 1941, went through a similar process of appreciation and analysis to address the problems they faced then a distinction could be awarded for this operation, doubly earned when noting that it was, most assuredly, an exercise with troops, and against a fighting force of immensely high morale and professionalism. 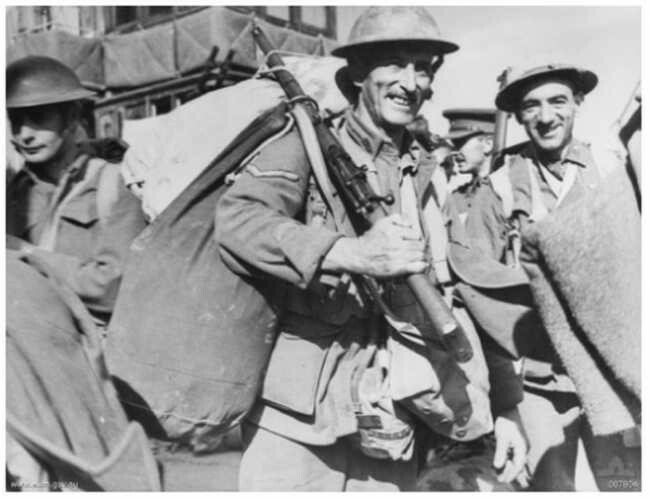 While it would be a stretch to call Crete decisive in any analysis of the outcome of the war, it was a small Australian defensive gem, a win at a time when bad news seemed to be everywhere prevalent, even allowing for the eventual German victory. Seventy-five years later, when the men and women who fought there, on all sides, and in what was a very cosmopolitan campaign have almost all gone, I would suggest, passed on, it is important that we do not forget them or a battle that was unique in warfare, and that would have lasting ramifications in a number of ways. Airborne operations later in the war either did, to their gain, or did not, to their detriment, learn Crete’s lessons. In later years, very many armies around the world, right up to the present day, have given much thought, and expended much effort, in creating an airborne or airmobile component, a thought process with its genesis in Crete, 1941.